One of the jobs our tree surgeons carried out this week was to sectional fell some mature Leylandii…. We carry out a lot of conifer tree work in Norfolk this time of year before nesting season starts. 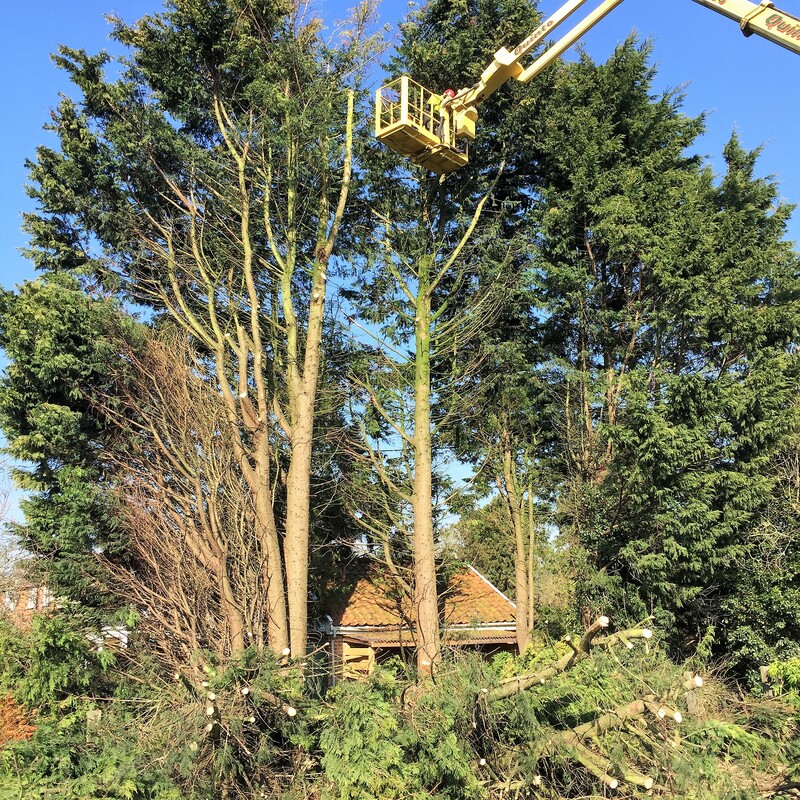 We do nearly all our conifer removal during end of September and the end of March, this is to avoid coming into contact with nest birds as all nesting birds are protected by law. The day started about 8.00am when the team arrived on site, the first job was to fill out and sign the risk assessment, the team then had to removed a post and rail fence in order to gain access to the trees using a MEWP ( Mobile Elevated Work Platform ). A MEWP was being used on this occasion as there was a ditch located under the trees making hard to gain access using ropes and harness safely, the ditch would also make it more awkward when rigging pieces down. The work was being carried out using a 3 man team a IPAF certified operative in the MEWP and then 2 ground staff one of which a climber who can carry out Ariel rescue if needed. The local land owner wanted all the green waste left on site he was going to use it in the Pheasant rearing pens as ground cover, this saved both time and a considerable cost to the client. Our tree surgeons are all fully qualified for the tree work which they undertake and have many years experience in all aspects of tree care, which include dismantling, felling, crown lifting and reductions, dead wood removal, formative pruning, tree surveys to BS5837, tree hazard reports, pest and disease diagnosis, bat inspections, stump grinding or treating and tree planting. Our fully trained staff allow clients to be confident and assured of the quality of our work and a £10,000,000 public liability insurance offers peace of mind.